Jussie Smollett's injuries after being "brutally attacked"
Jussie Smollett Brutally Attacked… or Not? 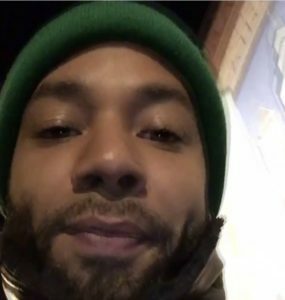 CHICAGO— Jussie Smollet was brutally attacked while walking to Subway Restaurant. The attackers were in ski masks, wearing MAGA hats yelling racist and homophobic slurs, then put a noose around his neck in an attempt to lynch him. He was hospitalized and is now healing from his broken ribs, bruises and cuts. He is in stable condition. Police are treating this as a hate crime. This is what the media is reporting, absent of facts. Jussie Smollet, 36, is an actor. His rise to fame can be attributed to his character Jamal Lyon on the television show series, Empire. 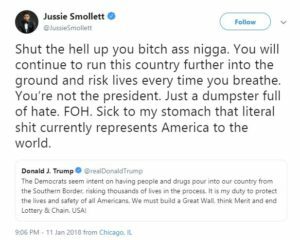 Smollett has used social media to voice his disapproval of Trump and his supporters. 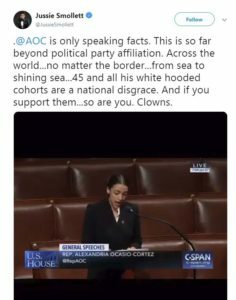 Smollett’s digital footprint spews hatred for President Trump and his supporters, his disgust for “white people” and support for people of color, the LBGTQ community and democrats, battling twitter wars against anyone that disagrees with his standing, including President Trump. His latest YouTube video demonstrates his perspectives of racism, using nooses and images of lynching, which is connected to the civil rights era with images of KKK and white hooded racists. 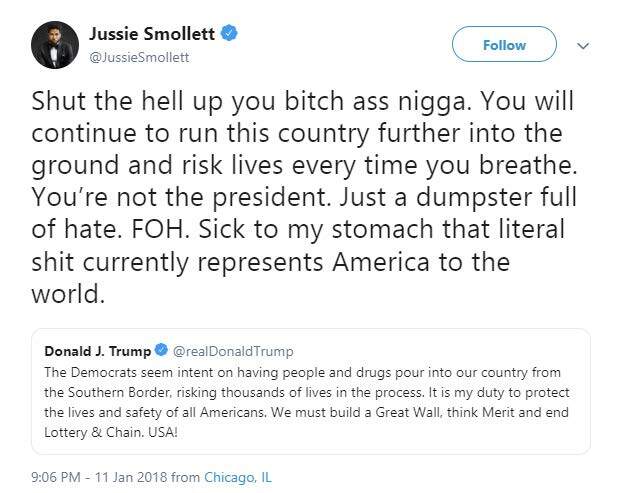 Smollett’s mediocre acting career and D list popularity quickly changed on Tuesday morning when “the story” went viral. Almost immediately he became a household name as a victim of a hate crime perpetrated by the racist people who support President Trump, angering people on both sides. Smollett hours after alleging a brutal attack. Shortly before 2 am on Tuesday, January 29, 2019, Smollett walked to a nearby Subway in minus 11 degree weather alone, after he had rejected Fox Network’s offer to have personal security due to an alleged threat letter. Smollett told police the attackers were wearing ski masks yelling racist and homophobic slurs. Investigators have uncovered footage from area cameras that have his timeline documented with the exception of approximately 55 seconds. Footage places Smollett walking alone on a Chicago Street after departing Subway Sandwich. Then for less than 60 seconds he was not captured on tape. He reappears on video with a rope hanging around his neck and still holding his Subway Sandwich, according to the Chicago Police Department. Smollett appearing days before his allegations. Smollett walked into his building, passed a security guard and into the elevator. The high definition surveillance reveals he has a type of road salt on his shirt. Smollett waited more than 40 minutes before contacting police. Upon arrival, Smollett requested the officers turn off their body cameras before he’d continue. Smollett still had the makeshift noose around his neck, as if he was “wearing it as a tie” according to police. He reported two individuals wearing ski masks had attacked him, using racist and homophobic slurs. At that time he had not told police anything about the attackers’ gender, race or political affiliation. After police left, Smollett transported himself to the hospital. The hospital reports that Smollett appeared in “good condition” and released after his exam. He was not hospitalized nor did he have broken ribs or black eyes. Smollett had a minor surface scrape on his cheek. Within hours, TMZ broke a gripping story of Smollett being brutally attacked by two white men wearing MAGA hats, screaming racist and homophobic slurs at him, then tying a noose around his neck and dousing him with a chemical while yelling “This is MAGA Country”. TMZ stated he was hospitalized recovering from broken ribs. Mainstream media followed TMZ’s lead reporting this was a brutal attack and celebrities as well as politicians expressed their fear for Smollett’s life and the horrific attack he had endured, some painting him as critically injured. Kamala Harris referred to the alleged incident as an “attempted modern day lynching”. Smollett’s social media depicts Trump Supporters as racists from the era when lynching, KKK, and white hooded gangs perpetrated crimes against people of color. People took to social media to express their doubt due to no witnesses or collaboration, accusing Smollett of making up the story for political reasons. This time, he told police he had a witness because he was talking to Brandon Moore, his Music Manager, at the time of the attack. Moore “clearly heard” the racist, homophobic comments and the attackers stating “This is MAGA Country” while he was being attacked, yet he did not notify authorities. Smollett refused to give Police his phone or records so they could collaborate the story. 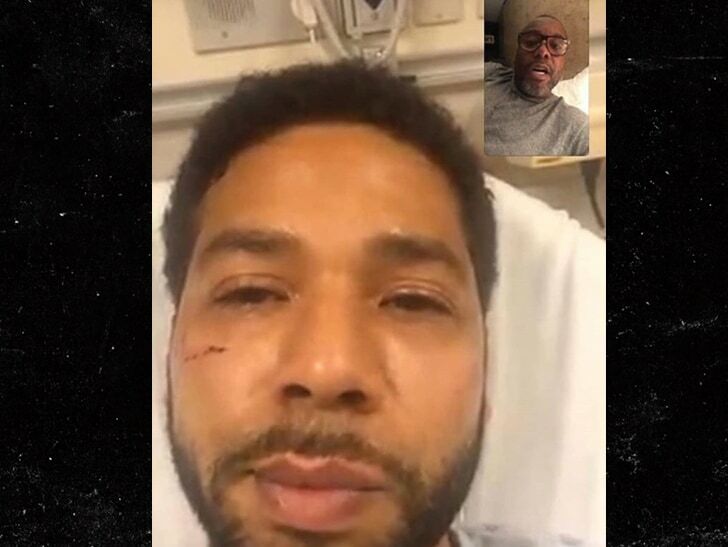 Lee Daniels posted a screen shot from a facetime conversation touting his victimization of a homophobic and race hate crime. After people commented on the lack of injuries, the post was quickly deleted. Smollett’s camp have been working around the clock having posts of the picture removed as soon as they are reposted. Even Google is protecting the lack of collaboration with the facts supporting this anti-trump non credible story by blocking searches such as “Jussie Smollett hoax” proving further that this is just another attempt to undermine our president. Politicians and celebrities used Twitter to show condolences and sympathy for Smollett, some exaggerating the details of the alleged incident, scolding those who questioned the details of the story, labeling them as racist. Many celebrities have used their platform to blame President Trump and Mike Pence for the alleged attack including Ellen Page. According to Anthony Guglielmi, Chief Communications Officer for Chicago Police Department, “detectives have gone over hundreds of hours of video tape” to find some evidence collaborating Smollett’s story, yet have come up empty handed. Detectives have found no videos, witnesses or documents to collaborate Smollett’s outlandish story. Chicago Police Department said a dozen detectives are working endlessly to pursue every possible lead in spite of Chicago being one of the highest crime areas in America. They have prioritized this incident in spite of the serious fatalities and unsolved homicides in the city. Next articleThe Government Re-Opens, But Now What?